Recently, there has been reports comparing Kay Tse (謝安琪) to Fiona Sit (薛凱琪), in which their physical appearances and singing styles were said to be similar. Rumored to have gone under cosmetic surgery procedures, both women’s faces became more slim and morphed into perfect oval shapes over time. A side by side comparison of their current photos revealed a shocking resemblance between Kay and Fiona. Kay’s husband, Louis Cheung (張繼聰) avoided the embarrassing issue, and said he preferred Kay’s looks. Since her debut, 33-year-old Fiona Sit’s feature have become more sharply defined. After a trip to South Korea in April, Fiona returned to Hong Kong with sudden eyelid puffiness. Her skin sensitivity required treatment with steroid cream. Aside from key film promotions, Fiona was rarely spotted in public in early April, claiming that she had to deal with her face ailments first. Thirty-nine-year-old Kay Tse’s face has undergone significant changes as her music career became more successful. Aside from getting braces to achieve a more perfect smile, Kay’s eyes were widened and a slimmer jawline appeared. She also reportedly received breast implants in 2009, as her bustline went from a 32A to 36C size. With new confidence in her figure, Kay has taken on a more glamorous image and often flaunts her hourglass figure at stage performances. Maybe they are long lost relatives/sisters? Wow, Kay use to look Uuuuugly……….hard to imagine if she would have survived in this industry if she hadn’t done plastic to her face. It’s SO obvious Kay looks nothing like before, when she first started she was very “blah” looking. Wow, plastic surgery can do a fantastic job these days. Artistes are considered very “lucky” to get whatever pretty faces they want! non asian people always say all asian look alike anyway. Definitely don’t blame the airport security if the person does not look the same as her photo in the passport. 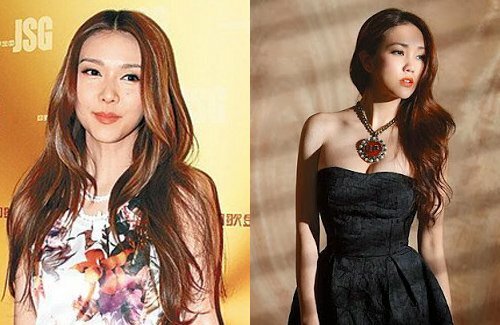 Based on the photos of Fiona Sit and Kay Tse before they had plastic surgery, I would say that Fiona looked prettier than Kay. Fiona just had her face trimmed, but she was still quite cute and pretty. Kay looked very bland before plastic surgery. God given face dun wan.. still go for plastic surgery. they will have issue when grow older..
Face being modified + make up + photoshop = making some people looking so similar. Really confusing sometimes. 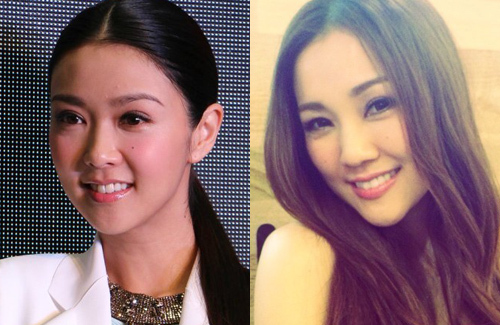 Now it’s HK actresses who look alike. I prefer Kay Tse, coz she looks good and elegant after PS. fIONA has become a plastic addict now.. I can see she looks different every year.